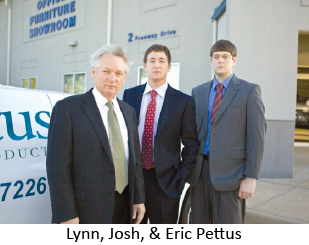 When Pettus Office Products was established in 1989 by Lynn and Amanda Pettus, their main goal was to create a family run business that offered a wide range of products, exceptional value for money, and remarkable customer service. Of course things change very quickly in the business world, however, some two decades later we still remember the roots that we were founded on. Since then we have grown into the largest independent office supply dealer in Arkansas, but we still believe in those same core principles which mean that once you buy from us, you will never need to try another office supply company ever again. You will still find us offering exceptional customer service, which we are able to do thanks to our incredibly dedicated professional sales team. We are also able to offer a professional furniture design team who are ready to design a custom, tailored furniture set for your office, to really make you stand out from the crowd. Pettus Office Products is a member of Trimega, an Office Products buying group, which gives us the buying power of over 10 billion dollars. This means that we are an exceptionally powerful force in the market place, making it easier for us to source bargains direct from major manufacturers and suppliers. Of course, we are then able to pass these bargains onto the most important part of our business - our customers! Which other office supply dealer can offer you over 30,000+ products available through a nationwide warehouse network? From our humble beginnings we have steadily grown and now have a 40,000 square-foot building, which houses our dedicated 5,000 square-foot office furniture showroom. We are proud to serve large and small businesses, and always offer a wide range of products at fantastic prices, all backed up with our outstanding customer service. Our website utilizes cutting edge technology that no other independent dealer or big box store has, which allows us to offer you a shopping experience like none other. So, regardless of the size of your business, you can use our site to find great deals on popular office products, like copy paper, folders, binders, janitorial supplies, and more. We think you'll find our business-specific ordering tools make the process of buying your supplies as fast and easy as possible. And remember, our highly trained staff is here and ready to help with any queries you may have. © 2016 Pettus Office Products. All rights reserved.